A majority of people who come into my office have some sort of digestive issue. This is why digestive enzymes can be so helpful to so many different people. 70 to 80% of your immune system is located in your gut. This is why it is so important to start with building a healthy diet first. When you have a healthy digestive system, then your immune system is stronger. When your immune system is stronger, you have the ability to be more flexible with all types of pathogenic exposure. 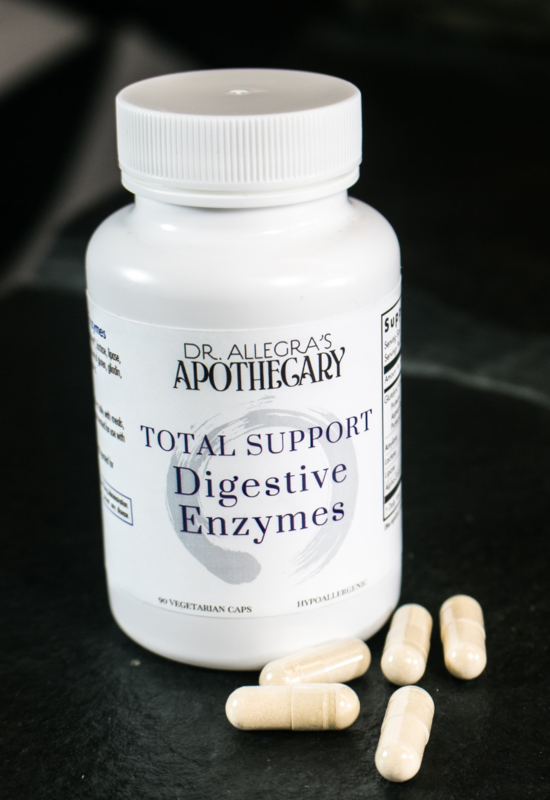 A digestive enzyme can help you build your digestive function, by helping you break down your food more fully. When you were able to break down your food more fully, you have access to more nutrients. When you have access to more nutrients, you have more building blocks to use to help your body heal. When you have more nutritional building blocks available, your immune system has more resources to run itself properly. When you have more access to the nutritional building blocks, your metabolism has more resources to run itself at a proper rate. Naturopathic Physicians have long known that strong digestive function is the key to building a strong foundation of health. Total Support Digestive Enzymes will help you break down fats, proteins, carbohydrates, dairy, and gluten better. Of course, if you are allergic to nuts, dairy, or wheat, you still need to avoid these foods completely. If you avoid some of these foods due to allergy, autoimmune disease, or intolerance, these enzymes will help you break down any inadvertent exposure that you might have. This will reduce the inflammatory reaction that can occur from consuming foods that you are sensitive.